Photos: For the 180th straight year, dignitaries march from Abo House to Rashbi's tomb in Meron. A 180-year-old Lag Ba'omer tradition was upheld on Shabbat (Saturday) in northern Israel, when dignitaries walked with the ancient Torah scroll from the Abo House in Tzfat to the tomb of Rashbi (1st century sage Rabbi Shimon Bar Yochai) at Meron. 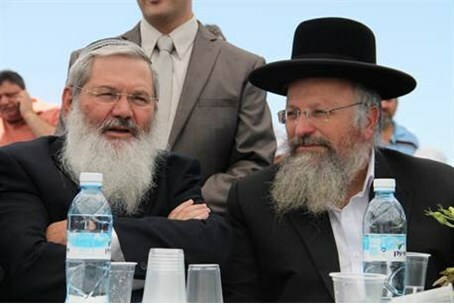 Rabbis, Knesset Members, mayors, heads of religious councils, and delegations from communities in the Galilee, the Golan and Samaria all took part in the event. Also in attendance were former Justice Minister Yaakov Ne'eman, and Tzfat Mayor Ilan Shohat. Additional participants were representatives of the French Embassy in Israel, who have been taking part in the event ever since members the Abo family served as French consuls, for three straight generations. The guest of honor this year was the Deputy Religions Minister, Rabbi Eliyahu Ben Dahan. "Rabbi Shmuel Abo, made aliyah to the Land of Israel in the early 19th century, began the tradition (of a parade with the Torah from Tzfat to the Rashbi's grave on Lag Baomer). He was the head of the Jewish community in France. He bought land at Rosh Pina, in the Galilee, and the Rashbi's burial plot, which until then was completely neglected and was a place where cattle grazed. In appreciation, a Torah scroll was written in his name and on Lag Baomer of 1833, he placed the Torah scroll at Rashbi's tomb. He saved Rashbi's tomb. Since then, every Lag Baomer eve, a parade goes out from his home in Tzfat to Rashbi's grave at Meron."